Could the last supporter of small government turn off the lights when they leave? So, Canada’s New Nanny™ banned light bulbs today. Today, Natural Resources Minister Gary Lunn announced that the government would force retailers to phase out incandescent light bulbs by 2012. This kind of action is actually counter productive to our progress and to the development of even greener technologies. By tying the invisible hand of the market, the Canadian government has in effect created an artificially high demand in fluorescent lights instead of letting Edison-style incandescents compete with the swirly fluorescents in the marketplace. The inefficient bulbs banned today cost seven times less than the fluorescent variety. Indeed, cost itself poses the problem. By removing incandescent bulbs from the marketplace, the government is removing competition. Now, manufacturers of fluorescent bulbs do not face competing pressure from the incandescent demand. Thus, there is less incentive to make a cheaper and even more efficient fluorescent bulb now that the government has removed its competition from the shelves. Over the long term, we may have in fact stunted the development of cheaper and more efficient means of illumination. Some may argue that over time, due to energy savings, fluorescent bulbs have better value than incandescents. If this is the case, there is already incentive to switch over. I would rather the government give 100% tax credits on fluorescent light bulb purchases than have it ban me from making my own consumer choices. Today, I am a little disappointed in my Conservative Party. This is also the same party that two short years ago argued that banning trans-fats was counter to the principles of consumer choice. By one extension, this light bulb decision is even counter to the government’s position on the long gun registry. In 2012, bureaucrats won’t have light bulbs to register. No, by 2012, the government will have thankfully banned harmful incandescent bulbs and the only ones that you’ll be able to find will be on the black market. This isn’t the party that favours government regulations, bans, and registrars is it? Further, what secondary effects can are we not considering? Studies have shown that children exposed to fluorescent light were statistically more likely to develop hyperopia (far-sightedness). Children under the age of two whose rooms were lit with fluorescent lighting are more likely to develop astigmatism. Fluorescent lighting has also been shown to heighten the symptoms of agoraphobia. So, the government has decided to ban light bulbs to appease the growing hysteria that, some might say, stems from the left-wing need for global social and economic reconfiguration. Granted, the ban will have a measured benefit in the short term. But, for reasons I’ve outlined above, it is best for the consumer to make such a decision because the market has shown a great talent for addressing consumer needs, whatever they may be. If a lightbulb is turned on in Timmins, will a tidal wave hit Japan? Posted on April 25, 2007 Author Stephen TaylorCategories OtherTags canada's new government, compact fluorescent bulbs, gary lunn, lightbulb ban, regulations, small governmentLeave a comment on Could the last supporter of small government turn off the lights when they leave? Kate McMillan did some fantastic work yesterday uncovering image manipulation by the Canadian Broadcasting Corporation on an April 19th story about the government’s sobering Kyoto costing. McMillan discovered that the CBC had cropped and applied a photoshop “dirty” filter to an image of smokestacks in Toronto to accentuate environmental damage. 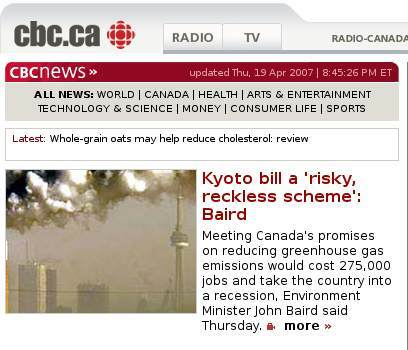 Not only was the juxtaposition of pollution and a story on Kyoto costing inappropriate (a less but still inappropriate image would have been a photoshopped stack of papers stamped “Kyoto” crushing the piggy bank of a Canadian family) but to manipulate an image to reflect a editorial point of view is downright unethical. The image was also used in a news story back on February 14th. Of course, this isn’t the first time that agents of news organizations have manipulated images dishonestly to exaggerate the news in order to convince others of their worldview. News organizations ought to be dispassionate observers and reporters of events and never should have an agenda of convincing the audience of the merits of any particular agenda. Posted on April 19, 2007 Author Stephen TaylorCategories OtherTags bert brown, bill c-43, conservative party, crowfoot, dan hays, kevin sorenson, michael fortier, reform party, senate reformLeave a comment on Senator-elect to serve in the Senate! Last night, I had the opportunity to be an invited guest speaker at Third Monday, a monthly gathering of PR and government relations professionals on the topics of blogging, politics, and the emergence of social media as media. It was an enjoyable experience as I met some of Ottawa’s top thinkers in the marketing of products and ideas. Immediately, I was able to appreciate the depth of knowledge that the attendees had in blogging and other forms of social media. After our preliminary chat and before I took the stage, I knew that the crowd was past the stage of explaining “a blog, or web-log is a form of website authored by an individual or group that writes on topics in reverse chronological order”. This was refreshing to know, as I knew that we’d be able to get past the technicalities of the medium and discuss the social, legal and ethical implications of writing a blog. I have raised open questions in the past about a blog’s role in cataloging one’s observation of events. Specifically, how does one define blogs as media? One observer noted that unlike airwaves, the resources of the Internet and the delivery of information is not limited in a sense that a government body ought to license or regulate its use. Of course, in Canada, we tend to suffer over-regulation as the rule so it was interesting to consider the dissemination of media via the internet as an unregulated resource. However, some in this country would advocate for regulation of media, not because of the scarcity of the resource, but for control of content. But what of “blogs”? I’ve come to the realization over the past few weeks (and indeed years) that blogging is simply a tool, or the method by which one’s ideas can be disseminated. A “blogger” ought not to represent a certain class of individual with categorical privileges, rights and restrictions. Like the pen, microphone, or typewriter, a blog is simply the tool. The blogger is the reporter. And of the question of whether or not blogging is journalistic? Last night I was asked if what I do is journalism in any sense. To a degree, I would muse that I am an observer and reporter of news events. Journalists in the mainstream media are employed by companies that are owned by large media organizations (like Rogers or Bell) or powerful teachers unions. Of course, a reporter’s loyalty ought to be only to the truth. I believe that what I do is truth mixed with my own sincere opinion. Then again, some journalists are also analysts or columnists and base their views on what they perceive to be true. They have their partisan preferences and are paid to provide opinion. Certainly that opinion has been focused through a lens of experience unique to the individual. Am I a journalist, reporter, or columnist? Some may say that I should not be considered a journalist since I have my own agenda. One CBC journalist once complained to me that I don’t declare my biases up front (I think this was derived from a similar charge that I had leveled at him seconds before). “It’s right there at the top of the page — Conservative Party of Canada Pundit”, I explained. I was astonished to hear the CBC journo dismissively grunted that “it’s not enough”. To distill what I do to its base elements, at the end of the day I’m just some guy with an internet connection, opinions and $20 a month to spend on website hosting. However, in a political climate bent on accountability, transparency and high ethical standards (and a country where one could do a Historica minute on our proud regulatory traditions), must I consider following a certain code of conduct? Legally, as long as I don’t write hate or indefensible libel against an individual or group, I believe that I’m entitled to speak as I wish; I certainly do not hold any elected office and am not accountable to anybody but myself. Ethically, however, as part ‘shoestring’ media, I believe that I ought to conform to a certain ethical standard. I hope that I’ve had some degree of success in adhering to it. I suppose after speaking to a room full of lobbyists, individuals that navigate the ethical and legal complexities defined and redefined by Ottawa, these thoughts tend to come to the fore rather than reside nebulously at the back of one’s mind. If one is to assume that this blog has some measure of influence over its readers and if one were to further assume that many of those readers are policy makers and journalists, does these considerations pose certain ethical dilemmas given certain scenarios? I’ve always stated that my blog has been successful in most part because of my readers. As my audience has grown, more and more people send me interesting ideas and items for my consideration. Of course, some of this material comes from political parties (including anti-Dion Liberals), some comes from the media itself (if it’s too ‘raw for prime-time’). Most of the rest of it comes from everyday Canadians that send in interesting observations. However, at Third Monday, the general question came up asking if I could be sent propaganda by interest groups? Could this information influence me? For example, could someone from the oil and gas send me information to muddy the waters on climate change? Of course they could. However, I would never write anything contrary to my own opinion and I try to verify all facts to a certain degree of confidence. I’m also faithful to my sources and would never reveal who has sent me information. One certainty exists in a media climate that is constantly changing: our views of media are undefined and may never be. A blog is simply a medium, as I’ve stated above. However, I’m certain that some in the MSM would say that blogging has had the effect of admitting pedestrians into a noble profession. Indeed, the cost of blogging is virtually nil; one only needs to go to the public library to publish one’s thoughts to the world. Blogging has also been a boon to democratic participation as one can participate in formative policy based debate with other citizens as frequently or an infrequently as they wish. Democratically, a citizen is not simply reduced to a voter anymore. I do, however, believe that the evolving definition of journalist ought not to be confused by the medium. At one time even television reporters had to fight for access. Blogging may lower the threshold to participation; however the blogosphere can also be viewed as the best crucible in which those that ought to be read, will be and those that don’t, will figuratively burn away. Thankfully, the internet is the closest medium that we have that approaches an unlimited information resource. Let’s hope that nobody ever tries to regulate it, for we should all have access. What follows is a personal theory that I’ve been assembling from observation over the past month. There are only three people, I believe, in the Conservative Party who actually know about an election, and I’m certain that even they squabble over timing. There won’t be an election this spring or summer. First, the Conservatives have been doing everything in their power to convince us of the opposite. Consider the training conference that the party just held in Toronto. This affair was no small feat and if I were a Liberal watching from the outside, I’d be anxious. Further, the Conservatives just showed off their 17,000 sq. ft. war room to the media. Can you remember a party in recent history that has done something like this? Why show the media one of the cards in your election hand? Again, I believe that this had the effect of sending shock into the spines of Liberal Party officials. Stephane Dion, and his communications and strategy teams have been reacting to Conservative actions rather than taking the time to forge out their own long-term plan. Instead, the best Dion has been able to muster so far has been to complain that Harper is being “unfair” and that the Conservatives are bullies. The Liberals have not even begun to effectively present and communicate a long term policy plan for Canadians to consider. Stephen Harper is also enjoying some of the highest polling numbers that he’s ever experienced. He’s got the opportunity to plateau these numbers rather than pick the spike and hope he’s got enough of a gentle slope to ride down on the way to E-day. Back in 2004, when the news came out that Harper was in “majority territory”, this was the kiss of death. Soon after, Ontario voters reacted to the news in order to put Harper back into a comfortable place in their minds. With respect to comfort, this has been a key aspect of the Conservative plan, in my opinion. Stephen Harper’s strategy has been in part to be the status quo Prime Minister. Harper and his planners have done everything in their power to prevent Canadians from thinking that they’re rocking the boat. Take the latest budget, for example. Conservatives looking for a conservative budget were largely disappointed. “This is a Liberal budget” they exclaimed. The budget was heavy on spending and par for the course for most Canadians. Harper is hardly causing earthquakes in Ottawa. In fact, the more that Stephen Harper can do to be the Prime Minister in the back of the minds of Canadians instead of in the front of their minds, the better. Harper has indeed been enjoying polling numbers that would give him a majority government. Some analysts have remarked that the best ally that Stephen Harper has is time. The longer that he is Prime Minister, the more that the concept becomes comfortably entrenched in the minds of Canadians. Pair this with Harper’s status quo Prime Ministership and he can ride out high numbers without those numbers themselves becoming an offensive concept in the minds of Canadians. The summer is coming up and most will, as usual, disconnect from politics. The Prime Minister is hoping to be riding high going into the summer so that he can park his numbers there as Canadians get used to the concept of Harper in majority territory. I’m also getting the feeling that Harper may ride out his numbers far enough so that media observers will go from blaming him from being opportunistic if he were to call an election, to questioning his political acumen for not calling an election with such a good position in the polls. So, for those of you who think that Harper’s on the verge of calling (or orchestrating) an election, I think that it’s time to reassess. Perhaps that’s only what the Conservatives want you to think. Then again, maybe they want you to think like me.